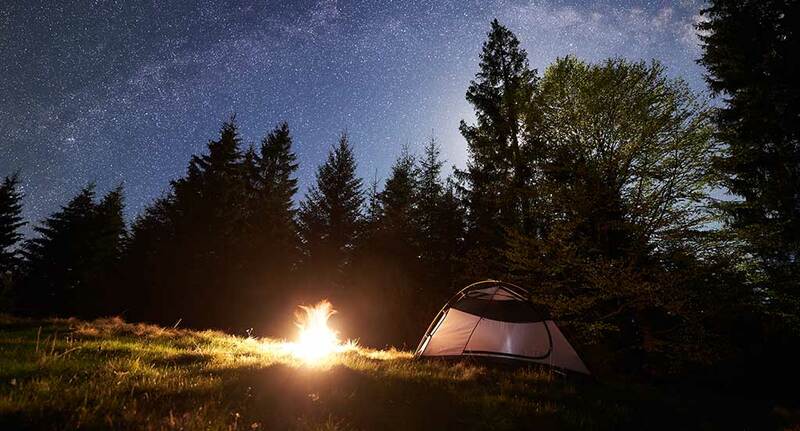 Camping outside can be adventurous and fun, provided you set your tent up in a favorable area that lends itself to sleeping well, and you bring along some of the accessories and amenities that will make tent camping more bearable. In this article we will outline several tips for sleeping well in a tent—tips that will leave you comfortable, toasty and well-prepared to take on the following day. 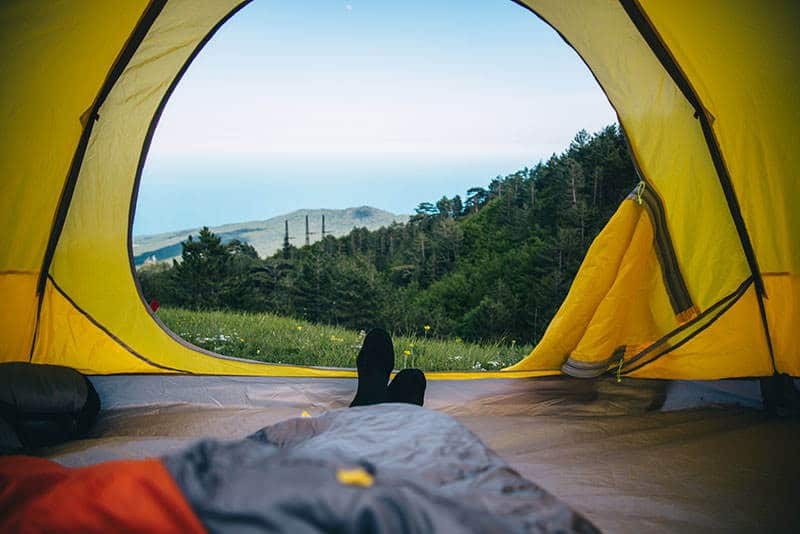 Below we have listed several handy tips for sleeping well in a tent, from finding the right spot in which to pitch the tent, to adding some of the creature comforts of home. Before you know it, you’ll be sleeping as well in your tent as you do in your own bed at home. Rule number one when setting up your tent while camping is to find a flat piece of ground on which to lay the foundation for the tent. Sleeping at an angle can cause the blood to rush to either your head or feet, making it very difficult to sleep and impossible to get comfortable. Upon arriving at your campsite, do some re-con to find the flattest ground possible. Once you have decided on a location, remove any large sticks or rocks from the area and place them out of the way. Next, take a broom (if you have one, of course) and sweep over the area very thoroughly, removing any smaller twigs and rocks from the flat area. In doing this, you create a clean surface without any rocks, sticks or debris to get in the way of your relaxed night’s sleep. Although a tent does a great job protecting you from elements like wind, rain and even snow, the bottom layer or foundation of a tent is essentially nothing more than a thin piece of plastic or nylon that offers little to no comfort for those sleeping within. Add to that the rocky and often uneven ground onto which most tents are erected and you have a hard, concrete-like surface that can make it nearly impossible to attain any rest. If your goal is to sleep well in a tent, you will definitely need to add some padding to the actual sleeping area. Without this padding, nearly every position you take within the tent is going to feel rocky, uneven and downright uncomfortable. Tent Pad. A tent pad is designed specifically for the bottom of a tent. These pads, which are usually made of soft foam rubber or other cushioning materials, are available in a number of sizes for different size-tents. Even if you have an in-between size tent; many of these tent pads are designed to be cut to size, offering you a soft place on which to lay your head. Air mattress. If you truly want to camp in the “lap of luxury” we recommend you pad the bottom of your tent with an air mattress. As the name suggests, an air mattress is a type of inflatable mattress that comes in the same sizes as regular beds—twin, full, queen and even king sizes. Air mattresses typically have a soft, cushioned layer of material on top, and some even have a built-in riser that inflates to mimic a genuine pillow. Blankets. If all else fails and you can’t get your hands on either a tent pad or an air mattress, you can always make do with blankets, provided you still have enough to cover you as well. Blankets can be stacked in layers to provide a comfortable sleeping base. This will not make your tent feel like a luxurious bed, but at least it will provide some underneath padding. When sleeping in a tent we recommend you use a high quality sleeping bag. A good sleeping bag can make all the difference when it comes to comfort, but you’ll have to make sure the sleeping bag you are using is rated for the weather conditions outside. Because you can always unzip a bag that feels too warm, you should pick a sleeping bag with a lower temperature rating than the lowest nighttime temperature you expect where you plan to camp. If you will use your bag into the colder months of the year, look at bags that can handle lower temperatures. 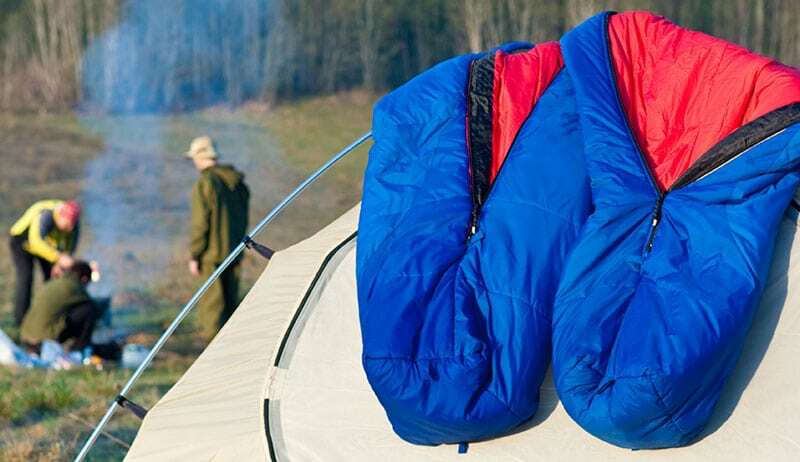 There are essentially three different sleeping bag types or ratings. They include the “Summer Season” sleeping bag, which is rated for 30 degrees F or higher; the “3-Season” sleeping bag, which is rated for 15 degrees F to 30 degrees F; and the “Winter” sleeping bag, which is rated for temperatures of 15 degrees F and lower. There are also bags designed for very, very cold temperatures, but unless you plan to camp in snowy conditions you will not need this type of sleeping bag. Semi-Rectangular: Also known as a “modified mummy” or “barrel” shape, this designation covers a variety of shapes, all of which offer a compromise between warmth and roominess. If you are camping in the wilderness, whether in a mountainous or desert setting, the nights can become quite cold, even dipping below freezing in some cases. In fact, in certain areas the night air can become so frigid that it actually interferes with your ability to sleep in a tent, leaving you shivering and wishing you were back home in your nice warm bed. One of the tactics for warming that cold tent in which you plan to bed down for the night is to add a heat source to the inside of the tent, one small enough to ensure it does not get in your way as you try to sleep. This is where a propane tent heater can come in very handy. A propane heater inside your tent utilizes the ignited form of the natural gas known as propane as a tremendous heating source. Once the propane is ignited, the elements in the heater are actuated to produce a warm, cozy glow that will make your tent-sleeping experience warm enough to tackle the cold elements just outside your tent. Sleeping comfortable in a tent means you will have to dress for the weather. Naturally, on very warm nights you can probably get away with just a tee-shirt and short pants, and you may even be able to sleep atop your sleeping bag rather than in it. However, on very frigid nights in the wilderness you are going to want to bundle up to keep your core temperature up and prevent hypothermia. On these occasions, you may want to wear heavy sweat pants and a sweatshirt to bed. You should also don warm socks to keep your feet warm, and you may want to wear a stocking cap to protect your head and keep the heat from escaping in that direction. Camping in the rain should be avoided at all costs, largely due to the mess it creates and the potential for getting wet as you sleep. However, if you are ever in a position where camping in the rain or snow is unavoidable, you will definitely need a plan to avoid getting wet and catching your death in the cold. This is where a canopy comes in, a structure that will help direct the rain and moisture away from your tent, allowing you to sleep through the night without the threat of becoming drenched. Because rain and other forms of precipitation are always a very real possibility when camping, it is crucial that you carry with you some type of canopy of sorts to go over your tent—a canopy that will catch the rain and direct it away from your designated sleeping area. Often made from waterproof fabrics, a canopy is a pliable structure designed to hang approximately 1-2 feet over your tent, thus stopping any water penetration and rolling the rain down and away from the tent. These canopies should be high enough to protect your tent and sloped towards the low side of the ground. With this design, the water that collects atop the canopy will roll off and head downhill, keeping you and your possessions dry and snug. If you are ever in a survival situation, with little to no gear save for a tent, a fire can help protect you from the freezing cold weather. When building this fire, be sure to construct a proper fire ring using rocks, and use logs that will burn low and slow throughout the night, with smoldering flames rather than leaping ones. Experts say you should also build some type of structure behind the fire—a structure that will prevent the heat from escaping in the opposite direction, and instead direct the majority of heat toward you and your tent where it is needed most.